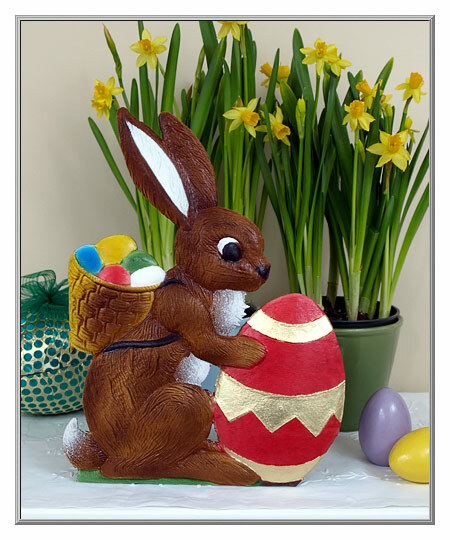 This charming rabbit cardboard cutout was produced especially for Springtime display in German shop windows. Made from very sturdy cardboard, the deeply embossed, die-cut decoration was hand decorated using vibrant lacquer paints. 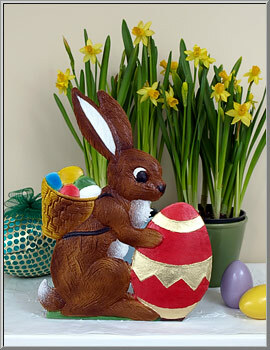 A real treat for any Easter enthusiast, this rabbit is a colorful addition to any collection. Sold as one vintage cutout. 11½" high by 8½" wide. We purchased this rabbit cutout from the original maker. The company sadly closed down a few years ago, so this is a final chance to collect this piece.